The piston is one of the very first parts that should be considered for coating. Coating the piston reduces friction and wear, reduces part operating temperature, can increase horse power and torque, reduce or eliminate detonation, allow higher compression ratios to be utilized and allow tighter piston to wall clear ances for a better ring seal. Pistons can be coated with three different systems. They are Dry Film Lubricants, Thermal Barriers and Oil Shedding Coatings. 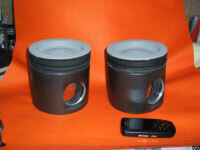 These systems can be beneficial on all pistons whether 4 stroke, 2 stroke, gas, alcohol, diesel, reciprocal or rotary. Thermal Barrier coatings insulate the piston against damaging heat transfer, keeping more of the heat generated by combustion, pushing down on the piston for greater power. By retaining minimal heat on the surface of the piston, less heat is transferred to the incoming fuel mixture, leading to a reduction in pre-ignition which leads to detonation. The coatings can also allow heat at the sur face to move more evenly over the surface reducing hot spots and the coatings reflect heat into the chamber for more even distribution of heat, allowing more efficient combustion of the fuel. This allows more of the fuel molecules to be oxidized, which in turn, means less fuel is needed for optimum power. The result is an engine that makes more power, can be run with a leaner air/fuel mix and less initial timing and has less thermal ex pansion due to a reduction in the heat absorbed. By applying a Dry Film Lubricant, friction, galling and wear is reduced. The lubricants are capable of carrying loads beyond the crush point of the piston. In addition, the lubricants are “fluid retaining” materials that actually hold oil to the surface beyond the pressure where the oil would normally be squeezed off. By applying thermal dispersant to the underside of the piston, oil that is splashed onto the piston to cool it will shed rapidly. Heat transfers most rapidly when there is a large difference in temperature. The longer oil clings to a hot surface the hotter the oil becomes. By shedding the cooling oil more rapidly, cooler oil is splashed over the surface more frequently. If the oil “hangs” longer, it absorbes less heat and blocks cooler oil from contacting the hot surface. A cooler piston grows less, allowing tighter piston to wall clearances.